A hair is a strand of corneous nature typical of all mammals that covers the outer part of the skin, called epidermis. Every hair is a filament of keratinous nature that grows on the outside of the skin or epidermis of all mammals. In the strict sense, the word “hair” is applied both to the head and to the rest of the body. It presents an external part (filament) and an internal part (root). Since the internal part has sebaceous glands and nerves that connect it to the rest of the organism, the health of the hair depends not only on itself but on the general health of the whole body. Hair diseases are those anomalies affecting the hair. Heredity: Sometimes hair problems have a genetic cause. Baldness, for example, has in many cases, some hereditary factors. 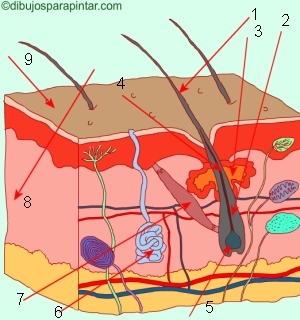 Physical causes: Skin diseases are directly responsible for the health of the hair. The principal is seborrheic dermatitis, but there are other diseases that involve abnormalities in the hair, such as ringworm. Hormonal diseases, for example, hyperthyroidism, weaken the hair, making it thinner. Otherwise, an insufficient production of thyroid (hypothyroidism) leads to too thick hair. Psychological causes: stress, situations of personal distress or unpleasant emotional states are factors that have an influence in healthy hair. Chemicals: The use of certain chemicals, such as chemotherapy in the treatment of cancer, improper shampoos, too rich in detergents, can cause the scalp to become oily and other increasingly aggressive components can alter the state of your hair. The inappropriate use of shampoos can even cause the hair to turn white. Food Problems: Poor nutrition can lead our body not not have the required amount of certain components to produce perfect hair. There is evidence that a deficiency of iron, copper, zinc, silica, or pyridoxine (Vitamin B6) or biotin can cause alopecia. Similarly, a lack of protein or fat, very typical in patients following strict diets for losing weight, or very common in poor countries, can lead to the same result. Environmental factors: Environmental factors can change the appearance of one’s hair. An environment too dry leads to drying your hair and it also becomes more brittle, growing less and with open ends. This happens on the beach, or when we are in a heated room. A windy weather and a slightly humid environment produce similar results. Bad Habits: The practice of drying the hair with a too hot dryer, drying it with a rough towel while doing a lot of pressure, using too brisk brushing combs or inappropriate brushes, excessive stretching of the hair, etc. are practices that lead to a poor state of your hair. More information on hair disease.